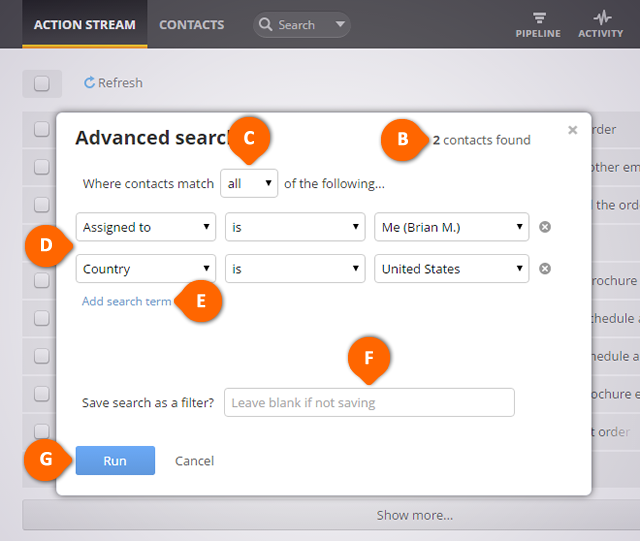 The number of contacts meeting your search criteria will appear to the top right (see B). In the Advanced Search pop-up, select all or any option from Where contacts match of the following… drop down to get results with all or any matching filter condition (see C). Select a predefined field (listed above), assigned criteria and enter your desired option (see D). Click on the Add search term link to combine multiple criteria (see E). To save this search, enter name in the Save search as a filter? field (Optional) (see F). Otherwise leave this blank to only run the advanced search without saving it. Click Run to generate the results and/or to save this as a filter (see G). Live update of available contacts is shown in top right corner of the Advanced Search pop-up. If a contact is updated as a part of a Bulk Update, this is not recorded when you run the Last Activity filter.